VietNamNet Bridge – With just a few days to go for Tet, the usual hustle and bustle associated with the Lunar New Year is missing at traditional markets and shops on the outskirts of HCM City. Sales of fresh foods like meat, seafood, fruits, and vegetables have been low-key at Ba Diem market in Hoc Mon District and Cau market in District 12. Only stalls selling dried items such as bamboo shoot, vermicelli, rice, sugar, and green peas reported higher sales than on normal days. Dung, who runs a dried foodstuff stall at Ba Diem market, said that while buying went up significantly this week, it was much less than at the same time last year. "Last year besides the two [regular] shop assistants, I also had to get my two grandchildren to help me, but not this year." 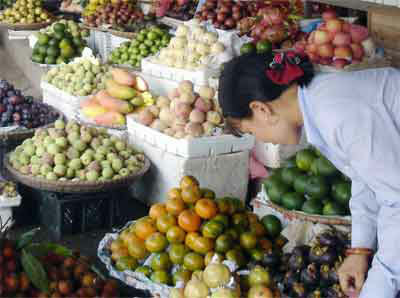 At fruit stalls in Ba Diem, watermelon and tangerine are displayed in large quantities, but people just come to see and not buy. Nguyen Thanh Tai of Dong Thap Province in the Mekong Delta said he had sent more than 400 watermelons to the market but sold only 20 in the last two days compared to 100 last year. Most customers came to inquire about prices and left, he said. At confectionery and soft drink shops on Nguyen Van Qua Street in District 12, sales of beer, soft drink, and sweets have been much lower than in previous years. Minh Tri, owner of a soft drink shop, said in past years some customers bought more than 10 cases of beer to gift others, but this year they bought only half, replacing the other five cases with soft drinks to save money. Le Van Dich of District 12, who makes and distributes tofu to wholesale markets, said in the past he would usually buy more than 10 cases of beer as gifts for his major clients, but this year he would gift them soft drinks. But the scene could not be more different in the city's downtown areas, with shopping malls, supermarkets, and garment and footwear shops being packed with shoppers. Nguyen Thi Dien, director of An Phuoc Company, said sales had jumped 40 per cent this week. Phan Van Kiet, deputy general director of Viet Tien Garment Company, said sales was up 25-30 per cent compared to the same period last year. There were an equal number of people buying for their own use as there were for gifting, he added. Dang Quynh Doan, director of Viet Thy Fashion Company, said turnover was up 15-20 per cent over the same period last year. The jump was not as high as that of last year, she said, but amid the economic downturn, the increase was a big surprise to the company. Several supermarkets and shops that signed up for the city's price-stabilisation programme have reported a daily rise in sales, saying shoppers thought that their prices were stable compared to shops in traditional markets.